I don't know about you guys, but in the height of summer I start craving food that feels light, requires no heat, tastes fresh, and doesn't leave me feeling heavy! And when we're hosting a summer party or a ladies night, we need a good summer appetizer that does the same! 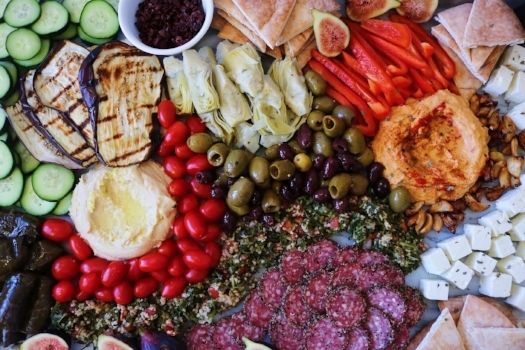 That's when a mediterranean mezze platter is perfect for this!! Not to mention, it's pretty healthy so you can feel guilt-free and it's the perfect platter that can provide snackage for all your friend's diet needs and intolerances and restrictions (aka its got dairy-free and gluten-free options!). And shoot, maybe best of all--it is SO easy and requires almost no cooking and barely any work at all!